The plunge in the Institute of Supply Management (ISM) composite index for manufacturing is a worrisome development from the perspective of recession-watching. Although there previously had been reasons to be concerned about growth, weakness had not shown up in the hard data (for the United States, at least). This is yet another reason why it is hard to take the threat of Fed rate hikes too seriously; but with the 10-year yield largely unchanged on the year, that is already discounted by the market. 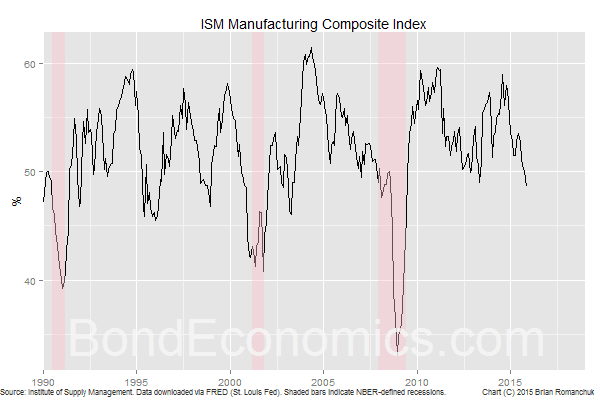 Historically, the manufacturing ISM index (previously known as NAPM, or "napalm" amongst those who were positioned the wrong when when it was released) was the most reliable leading indicator for the economic cycle. (The non-manufacturing index has a shorter history, and it is unclear to me how well it captures activity in the services sector.) This made it a common component of market timing indicators. However, it has had a somewhat mixed record in recent years. The problem is that manufacturing has lost much of its significance as an employer. 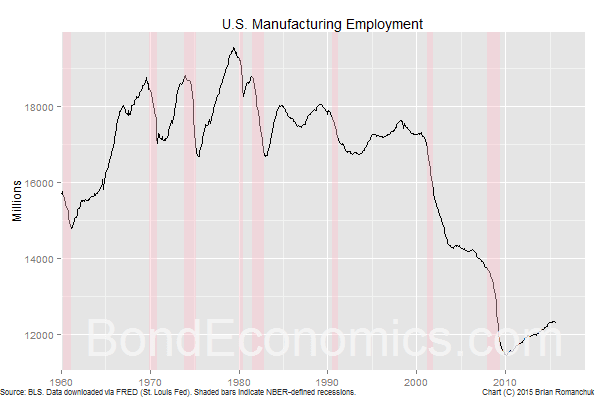 The chart above shows the utter collapse in manufacturing employment since 2000, although the downtrend started in around 1980. In the previous expansion of the mid-2000s, all that the sector was able to do was to reduce the pace of job losses. In the current cycle, there has been steady growth, a reaction to the previous sharp collapse during the crisis. However, even if the data might look reasonable as a percentage growth rate, the collapse in the level of employment means that this growth is just a drop in the bucket relative to the massive amount of underemployment within the U.S. labour market. As a result, the extremely high readings of the ISM manufacturing index in 2010 were misleading. Investors assumed that aggregate growth rates would be similar to those seen when the ISM hit those levels in earlier cycles, and hence positioned for rapid Fed rate hikes. However, that was a losing proposition, as the shrinkage of the manufacturing sector meant that it had much less influence on aggregate growth, which is what concerns the Fed. Although a manufacturing slowdown by itself might not be enough to trigger a recession, the weak ISM reading may be a signal of wider problems within the economy. Although this is possible, we need to keep in mind the previous dips in the indicator that did not lead to anything significant, such as in 2013. Even if there is a "manufacturing recession" as the result of an inventory correction, the effect on employment may not be enough to overcome the ability of the "automatic stabilisers" to keep the growth of aggregate nominal incomes steady during an expansion. I do not have enough information to allow me to make a recession forecast, but it does seem relatively safe to say that there are few reasons to justify tightening macroeconomic policy at present.